← Prophecy Central’s 20th Anniversary !!! Jesus is said to be “the ruler over the kings of the earth.” This is primarily a preview of His glorious return, which will be mentioned in verse 7, and described more fully in chapter nineteen. When He comes to Earth again, it will be as “King of Kings and Lord of Lords” (Revelation 19:11-16). Jesus had told his Disciples that the Kingdom of Heaven was “at hand” (Matthew 4:17). 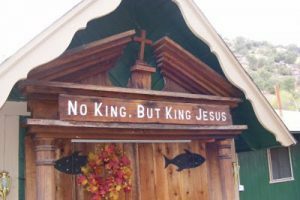 He knew his offer to be King at His triumphal entry would be rejected. Nevertheless, He will come in great glory in the future to establish it (Luke 21:25-31; 22:18, 30). In Acts 1:6 they asked Him, “Lord, will You at this time restore the kingdom to Israel?” He told them they couldn’t know the time, but when the Holy Spirit would come, He would enable them to be witnesses to the whole earth. Evidently the Kingdom would not yet be established at that time. He would not yet reign on earth, and the Disciples would not yet reign with Him, but they would spread the message of the Kingdom, even as He had been doing. That is why Jesus taught us to pray “Your kingdom come. Your will be done on earth as [it is] in heaven.” (Matthew 6:10). We still pray that way because even though His Kingdom does already exist in Heaven, and He is our King already, it still has not yet been established here on earth. Jesus told Pilate, “My kingdom is not of this world. If My kingdom were of this world, My servants would fight, so that I should not be delivered to the Jews; but now My kingdom is not from here” (John 18:36-37). While we are here we are ambassadors, representing Christ and His Kingdom. During this time, we establish outposts of the Kingdom in our homes, churches, missions, and other Christian enterprises. We seek constantly to gain new members of the Kingdom by following His example of ministering to their needs and giving them the Gospel. There is much “Kingdom work” to do now even though it has not yet been established on earth. This entry was posted in Church History, Commentary, Elections, Eschatology, King of Kings, Peace, Prophecy Central, Revival, The Church in Prophecy and History: Revelation Commentary Chapters 1-3. Bookmark the permalink.